Congratulations to Fridley High School seniors Hailee Schalwig and Harrison Blum, winners of Fridley High School 2019 Minnesota State High School League Triple “A” (Academics, Arts, and Athletics) Award. The Triple A Award is awarded to a male and female high school student who have exemplified themselves in academics, fine arts, and sports. Both Harrison and Hailee have enjoyed challenging themselves academically at Fridley High School while also maintaining extensive track records of extracurricular activities. The students will be recognized at this year’s Lion’s Scholastic Achievement Banquet on May 16, 2019 at Fridley High School. Hailee is a full International Baccalaureate (IB) Diploma Programme (DP) candidate, working hard to earn her IB Diploma. She sees a lot of value in her DP classes, which challenge her to think critically and consider lessons from multiple perspectives. Hailee said she enjoys pushing herself in academics, and her full-DP course load keeps her motivated and engaged. She maintains a 4.29 GPA and is on track to graduate this May with high honors. “You get out of school what you put in, so if you put in the effort, you’ll get good results,” said Hailee. Hailee is the vice president of band and plays in jazz band, pep band, and pit orchestra, playing multiple variations of saxophone. She also participated in marching band from freshman to junior year. Athletically, Hailee is captain of the Fridley High School swim team and softball team. She is currently the president of Fridley High School’s Chapter of National Honor Society, is a member of Link Crew (high school peer mentoring transition program), and was also a part of the Fridley High School math team for three years. 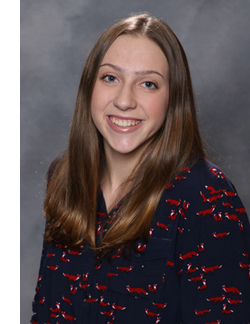 Hailee has enjoyed getting to know all her teachers, mentors and coaches at Fridley High School, but shared that math teacher Michael Wilmes greatly encourages her to push herself in math, which resulted in advancing past her grade-level. She also considers Swim and Diving Coach and MYP Coordinator Kari Reiter to be a great role model. Reiter was Hailee’s diving coach in 8th and 9th grade. Hailee also spent a lot of time with Reiter when she managed the FHS boys’ swim team last season. Hailee is considering attending Florida Southern College or Eckerd College in Florida. She plans to pursue her interest in the science field. 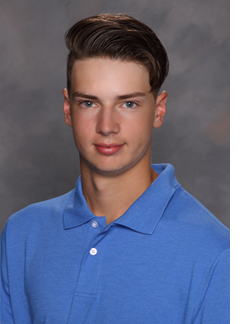 Harrison is captain of both varsity basketball and baseball at Fridley High School. He has been playing both sports since 1st grade, and feels that his involvement in athletics has shaped him into the person he is today. He recalled almost quitting freshman year basketball tryouts when the going got tough. “I remember Coach (Eric) Wright and Coach (Bryce) Richter being very encouraging to me, so I just kept going and I’m glad I did. I wouldn’t be the man I am today without those coaches,” said Harrison. “Playing baseball and basketball here has taught me discipline, hard work, teamwork and grinding it out every day, even if you don’t feel like it. You need to improve yourself every single day,” he said. Harrison participated in band his freshman through junior years at Fridley High School and played the baritone saxophone. Academically, Harrison enjoys challenging himself by taking advantage of the IB DP Higher Level classes. He maintains a 3.8 GPA and feels that his course load is helping him prepare for success in college. He also enjoys the IB curriculum framework that is reflected in his classes. Harrison’s top choices of universities to attend include: Minnesota State University - Mankato, Luther College in Iowa and University of Mary’s in North Dakota. He plans to major in business management with a minor in finance, and play collegiate baseball at his chosen college.